... to SCHWING-Stetter at bauma 2019. On more than 2,100 square meters we present you our highlights - be curious. As a small foretaste of what awaits you, you will already find some exciting information around the topic concrete on this page. bauma is a global innovation driver, engine of success and marketplace. It is the only trade fair in the world to combine the entire breadth and depth of the construction machinery industry.  Find out now about the products you can expect at bauma 2019. Stetter has been building truck-mixers in Memmingen, Bavaria, for around 60 years, and for many years also at various company locations worldwide. At bauma 2019, Stetter is now showing the 111,000th model, an UltraEco, with a special paint finish to mark the anniversary. Stetter's truck mixers are designed for efficiency, performance and economy. 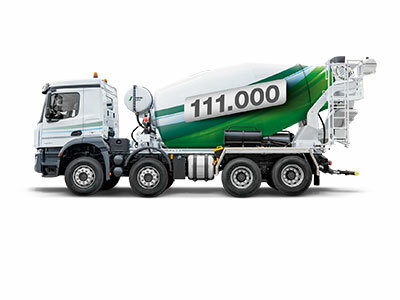 The high payload combined with the well-known high robustness and long service life stand for the success of this truck-mixer concept and make vehicles such as the UltraEco the benchmark for lightweight truck mixers. The UltraEco alone has been sold over 3000 times since its market launch in January 2015. The newly developed Stetter twin-shaft mixer DW 4.0 is the powerful heart of a 4 m³ Stetter batching plant. With the new mixer size, a hardened concrete output of up to 148 m³ per hour can be achieved, but individual batches of very small quantities from 0.25 m³ concrete can also be mixed. Compared to smaller mixers, the production costs for concrete can be reduced by up to 20 % per m³. Faster production saves time and also has a positive effect on the energy balance both during operation of the batching plant and due to the shorter loading time during operation of the truck mixers. 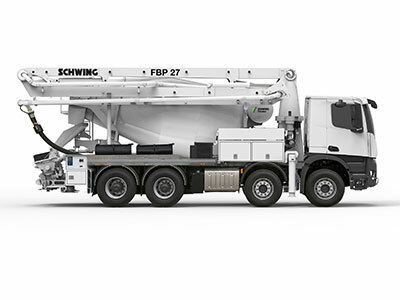 SCHWING has revised the boom geometry of the new FBP 27 truck-mixer concrete pump. The adaptations to the boom package expand the working area on construction sites so that concreting can now be carried out right up to the driver's cab when the boom is in the appropriate position. This is made possible by the extension of the first boom element and the extension of the opening angle of the last boom element to 278°. As in the predecessor model FBP 26, the boom in RZ folding uses only straight boom arms without offsets. The advantages: small boom width, low boom weight and high torsional stiffness. By using the Light Line truck-mixer superstructure, the extra weight of the extended boom element 1 was more than compensated. Mounted on a 4-axle chassis, the FBP 27 can transport at least 4.5 m³ of fresh concrete with a permissible total weight of 32 tonnes. The low space requirement of the FBP outriggers ensures high installation flexibility and enables safe construction even on cramped construction sites. Due to the large rear support feet, in many cases it is possible to dispense with the use of spacers when supporting. 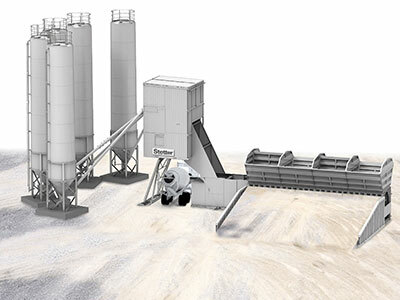 The newly developed Stetter batching plant M 3.0 is the model for the fast and large-volume requirements of ready-mixed concrete from mobile plants. The highlight lies in the pre-assembled components and the plug & play system. The plant is variable in its composition and with the twin-shaft mixer DW 3.0 guarantees a concrete output of up to 120 m³ fresh concrete per hour. The M 3.0 basic plant is built on a mobile steel frame which carries the folding upper part with the double-shaft mixer and the weighing platform mounted above it. Switch cabinet and feeder are also mounted directly on the steel frame. The auger, ladder and silo components are already completely pre-assembled on each of the up to five identical binding agent silos; their arrangement is flexible and adapts to the requirements and prerequisites on site. The in-line silo with its integrated mobile foundation and fully galvanized boxes with a volume of up to 45 m³ is also completely pre-assembled and ready for use. The batching plant is completely pre-assembled and tested at the factory and can therefore be used immediately ex works. The control cabinet is also pre-installed, so that the plant can be put into operation via plug & play with the appropriate pre-cabling. 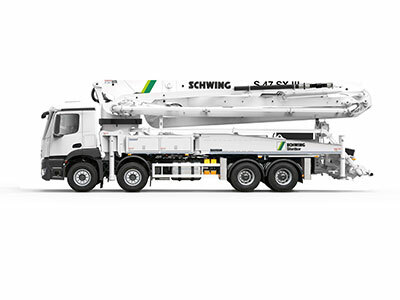 With the DirectDrive, SCHWING is revolutionizing working with truck-mounted concrete pumps. The innovative drive of the S 36 X DirectDrive enables an opening angle of 330° on the third boom element, while the last boom element can even be rotated 360° endlessly. 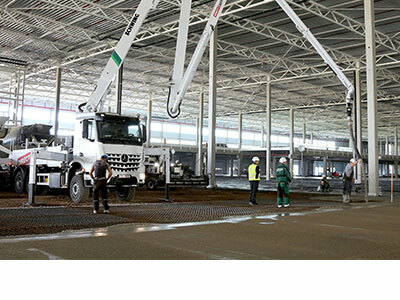 This allows the S 36 X DirectDrive to be used more flexibly than any other truck-mounted concrete pump in its class. Direct control of the DirectDrive hydraulic motors means that the operator's control commands are immediately translated into movements, so that the S 36 X DirectDrive boom can be driven extremely sensitively and precisely. The DirectDrive removes almost all restrictions at the last two boom joints that arise from the use of hydraulic cylinders. All the intuitive handling and all the thinking involved in operating a truck-mounted concrete pump, all the movements in halls and the threading into buildings have reached a new, revolutionary level and make the question of the classic boom folding types R, RZ or Z superfluous. The completely newly developed S 47 SX III truck-mounted concrete pump is another new addition to the III series. It combines many proven components from various development stages and series. A special feature of this machine is the high flexibility of the boom package, known from the S 38 SX Reptor series and positively rated by customers throughout, due to the exceptionally large and fully usable opening angles on the boom elements 4 and 5 and the intuitively operable roll-folding. The S 47 SX III achieves a reach height of 46.10 metres with its 5-section boom package. Mounted on a 4-axle chassis, the unladen weight is just over 31 tonnes. In addition, the S 47 SX III, which is less than 12 m long, has an extremely small footprint in this class, achieved by the support distances of 8.90 m at the front and 9.60 m at the rear. 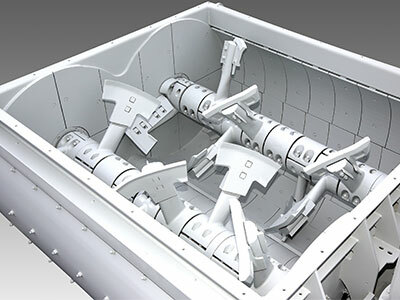 Further features are the optional "Active" assistance systems for boom damping and "Diractive". 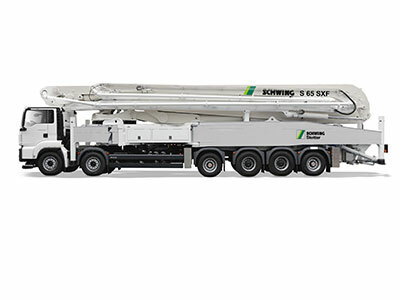 With a range of 60 meters and a maximum output of up to 162 m³ fresh concrete per hour, the flagship from SCHWING is predestined for use on major construction sites worldwide. In the first year after its market launch, two dozen vehicles were sold and delivered. Especially in the USA, the main target market, the S 65 SXF generated positive demand even before its market launch. The S 65 SXF is a completely new technical design, combined with SCHWING's well-known quality components from other machine types. One innovation is the new SXF outrigger, a combination of the curved SX outrigger that has proven its worth for decades and an additional flap element (fold = F). This means that for the first time a truck-mounted concrete pump of this size can do without multi-telescopic outriggers. and still impresses with the best in class footprint of just 11.58 m x 13.70 m. The heart of the S 65 SXF is the P2525 long-stroke pump battery. For an output of around 100 m³ fresh concrete per hour, which is usual in this machine class, less than 14 strokes per minute are required. The new Active boom damping system, which was developed by SCHWING together with other industrial partners, also ensures quiet working conditions. 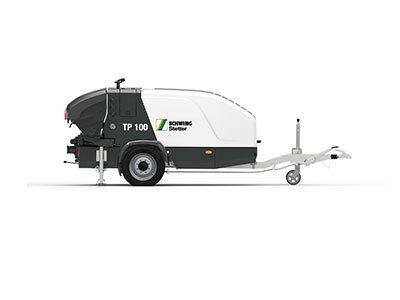 The TP 100 trailer pump from SCHWING is a completely new development in the field of mobile concrete pumps. The power pack for construction sites is used wherever screed, mortar, fine concrete or concrete with a grain size of up to 25 mm is to be conveyed efficiently and reliably. The ROCK valve known from the truck-mounted concrete pumps and stationary concrete pumps is also convincing as a XS-ROCK specially developed for the TP series due to its low displacement and low weight. In 1934, the 25-year-old master locksmith Friedrich Wilhelm Schwing founded his craft business in Herne/Germany. In 1957, SCHWING introduced the first ready-for-series-production oil-hydraulic 2-cylinder concrete pump, a worldwide standard that is still valid today. In the decades to come, SCHWING and, in parallel, Memminger Stetter GmbH, which later joined the SCHWING group, repeatedly set new standards in reliable and economical production, transport and placing of concrete. The batching plants, truck-mixers, stationary concrete pumps and truck-mounted concrete pumps have stood for reliability, quality and durability for decades. The same applies to the sludge pumps from SCHWING, which have been supporting the smooth and efficient operation of numerous industrial and municipal plants worldwide since 1973 thanks to their excellent reliability and simple maintenance.